Director Paul Thomas Anderson's latest Phantom Thread marks his first collaboration in a decade with acclaimed actor Daniel Day-Lewis. When they were last together, they produced an Oscar-winning performance with one of the actor's most iconic roles. He was manic, unpredictable, and created one of 21st century cinema's greatest antagonists. Time has passed, and the duo reunite for a film of a different beast. Instead of seeing Lewis play a man mad with power, he ends his career with one succumbed to co-dependence. It's a film restrained even by Anderson's lofty ambitions, and it creates one of the most compelling romances of the year. While there's no scene in which Lewis throws a bowling pin, the emotional scars feel richer and more compelling. It's a great film, and a touching way for Lewis to end his career on a very high note. 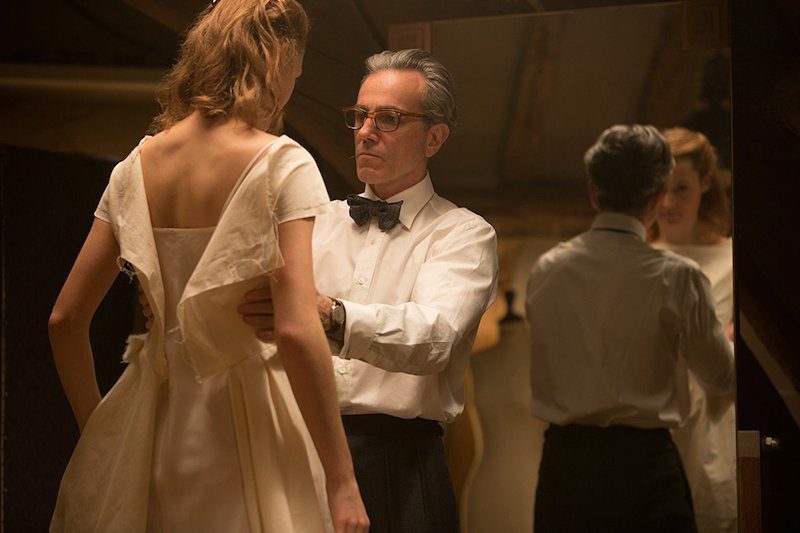 Much like the film around him, Phantom Thread is a film that only feels well-mannered. It begins with Mr. Woodcock (Lewis) preparing for a day of dressmaking. It's his last before Alma (Vicky Krieps) enters his life, kicking the story into gear of a "confirmed bachelor" finally finding love in old age. He is a man of strict regulation. He can't have his sister Cyril (Leslie Manville) announce bad news over breakfast for fear of starting the day off wrong. He can't have anyone butter toast too loudly. He may be a man who never raises his voice, but the connotations become clear. He needs order, which is a detail that explains his reclusive manner. It isn't that he hate people, but they simply come second to his career as a virtuoso with the fabric, capable of making dresses for queens and earning an unmatched reputation. His work is his pride, and nothing throughout the film comes close to replacing it. This detail makes his relationship with Alma all the more interesting. For a man who dictates breakfast with more rules than a Van Halen rider, he is taken by someone who bends to his will. Could it just be that her physical shape inspires him? Is it that there's something unspoken in Lewis' performance, hidden underneath countless petty grievances and brash comments? So much as a plate is never hurled throughout the film, but Anderson has created some of the most tense scenes of the year just by having Mr. Woodcock criticize improperly prepared asparagus at a surprise dinner. What should be a gesture of love is seen as one of spite. It's a power struggle between the couple, and it's never clear if they fully love each other. As the story goes, it becomes even more confusing, if just because they're clearly two different archetypes. Alma is more traditional, wishing to be the lover who is spontaneous. Mr. Woodcock, on the other hand, has a strict 9 to 5 lifestyle where one detail out of place makes him livid. It's why the film's most perfect metaphor may have been the most misleading in the trailers. Mr. Woodcock writes notes into the fabric. On one hand, it's inconsequential to the plot. However, it explains the "creative" side of Mr. Woodcock perfectly. His personal affection cannot be seen, but it's in his work of gorgeous flowing dresses, all seen being painstakingly created, sometimes by Lewis himself. He isn't an extrovert, and it's a detail that's hard for outsiders to understand. Lewis manages to paint his frustration almost like a critic, with each detail being discussed in a posh tone. His condescending tone feels more painful than any raised fist ever could. He loves order too much to let it go, even for the sake of Alma's satisfaction. They are a couple whose power to control the relationship drives the film into shocking places, but inevitably produces one of the truest portrayals of love. There will be fights, especially if you're married to a dedicated craftsman/artist (the story feels like Anderson's personal confession of his faults as a lover). It helps that the structure is placed inside something that's different for Anderson. He ditches the California coast in favor of European architecture with winding staircases and rooms that have centuries of beauty everywhere. The place is just as conformed to a pattern as Mr. Woodcock, and the only thing contradicting this nature is the music, which composer Jonny Greenwood does with a rich subversion of classical scores. The strings feel rich, booming through the scenes as if acoustically. The pianos feel layered, as if queasy from the underlying tension. It may be one of the few period pieces from Anderson that looks inactive, but it's only to help emphasize what drives relationships into the strange places. It's frustrating to not be spontaneous, and can drive a certain insanity. Krieps gives an excellent performance as Alma, managing to hold her own against Lewis as they make simple dinner scenes into poetic arguments of stares. Anderson understands that love isn't just about what is done, but what isn't. Sometimes that simply means not caring. The film comes from one of Anderson's richest periods as a director. Since 2012, he has produced three radically different films (The Master, Inherent Vice, and Phantom Thread) and an underrated documentary (Junun). For a man once known for his patience, it seems like speeding up production has made him a more interesting filmmaker, and maybe sees him finally being unafraid to be totally intimate. Phantom Thread is a film that actually feels personal in how its characters react, showing Mr. Woodcock's struggles to relate to family and significant others. There have been romances before in Anderson films, but none that feel as true as this one. This is a story that comes from experience, and feels more impressive given that Anderson never falls back on rambunctious scenes of characters yelling. In its place is a few selective expletives as the characters vulnerably question their usefulness, often stuck in helpless positions. Phantom Thread is another great film from Anderson, and one that feels at times reminiscent of Martin Scorsese's own collaboration with Daniel Day-Lewis: The Age of Innocence. In that film, he played a man in an affair who was tight-lipped for a different reason. He was able to convey so much with his youthful stares of desperation. In Phantom Thread, he has aged into a man of confidence and vulnerability, who finds solace in his work. As much as Lewis is likely to be remembered for his grandiose performances and ridiculous method acting stories, it feels important to know that he was an actor who could find the emotional core in any performance, which includes playing a man whose sympathies barely register verbally. Even if Mr. Woodcock doesn't say something, Lewis was able to convey it beautifully. It's a role that few others could pull off with such magnetism, which alone gives further fodder for the legacy of his status as the greatest living male actor. Nobody could possibly do what he did as well, though here's hoping that someone tries well enough to not be a joke in the process.